Deafness kept Beethoven from ever hearing a note of his Ninth Symphony, and death kept him from learning of his masterpiece's adventures and misadventures. Bismarck proclaimed the Ninth an inspiration for the German race, Bakunin heard it as the music of anarchy, Engels declared it would become the hymn of humanity, and Lenin thought it more revolutionary than "The Internationale." Von Karajan conducted it for the Nazis, and years later he used it to consecrate the unity of free Europe. The Ninth accompanied Japanese kamikazes who died for their emperor, as well as the soldiers who gave their lives fighting against all empires. It was sung by those resisting the German blitzkrieg, and hummed by Hitler himself, who in a rare attack of modesty said that Beethoven was the true führer. Paul Robeson sang it against racism, and the racists of South Africa used it as the soundtrack for apartheid propaganda. To the strains of the Ninth, the Berlin Wall went up in 1961. To the strains of the ninth, the Berlin Wall came down in 1989. John knew I would be fascinated by this because it deals with the common Mixed Meters trope that musical meaning is mutable according to who is listening. And of course it mentions Adolf Hitler, which I have been doing a lot lately. 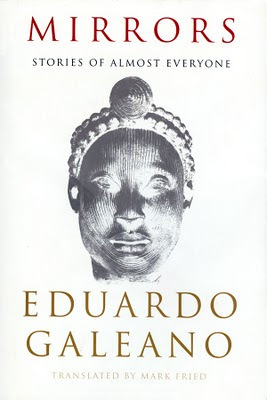 After reading about Galeano I ordered a "like new" copy of this book from an Amazon associate seller. The price was 39 cents. Yes, you read that correctly. Thirty-nine U.S. pennies for a $26.95 list price hardcover book originally published in 2009. Shipping charges were more than ten times the price of the book: $3.99. In capitalistic America such a low price for nearly 400 pages of printed matter can only mean a huge lack of demand. Could this be because Galeano says things Americans don't care to hear? Or maybe someone is giving copies away because they think Americans ought to hear those things. 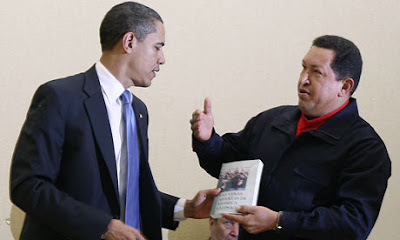 After all, the vilified Venezuelan president Hugo Chavez presented another of Galeano's books to Barack Obama, the increasingly vilified American president. 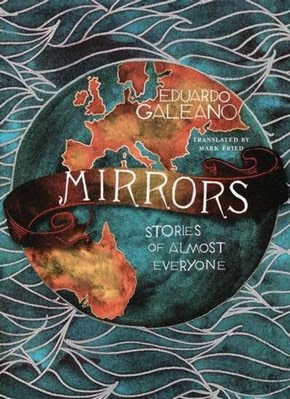 Mirrors consists of nearly six hundred short historical tales similar to the sample above. I thought to myself "It's a novel in the form of a page-a-day calendar." In reality it's a history book. It's the story of human culture told in sequential "sound bites". Each bite is short enough for even the tiniest attention span. It would be perfect for multi-tasking, channel-switching, constantly on-the-go media consumers. Except for one problem - it's a book. Galeano makes his attitudes perfectly clear. He is against sexism, racism, facism, colonialism, corporatism, imperialism and exploitation. He counters pro-western, pro-northern, pro-European bias. He lampoons the silly and he bemoans the greedy, the evil and the immoral. He talks about the crazies, the revolutionaries, the successes, the failures and the famous. Almost everyone. Galeano obviously has strong opinions. His little tales will make you think. Like the Beethoven symphony, what he tells is often open to interpretation. If you think about the stories too hard they could be profoundly depressing. You could even end up regretting being human. But in spite of that, the book is a really easy read. It would make a good blog. 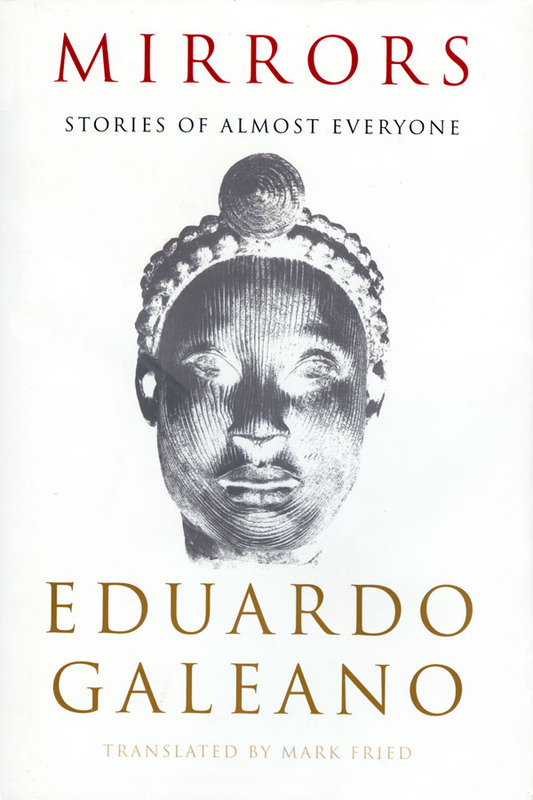 Listen to an interview with Eduardo Galeano on the NPR radio show Latino USA. He says "I am just a person fascinated by reality and the magic hidden inside reality." Other Mixed Meters posts mentioning Beethoven's Ninth: Everybody Loves Beethoven Probably and In Which Music Moves Slowwwly. Ring Festival LA will be a defining moment in the cultural history of Los Angeles. 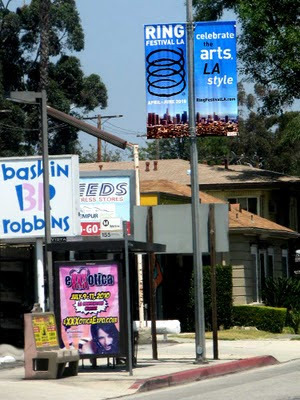 Ring Festival LA will be the most significant arts festival since the 1984 Olympic Arts Festival. the most interdisciplinary, cross-cultural, collaborative artistic and cultural event to occur anywhere. By the time Ring Festival LA ended, about six weeks ago, anyone could see that it had not lived up to this hype. Not even close. I suppose we have to cut Placido and Barry some slack. I'm sure they had the best of intentions. It is always with the best intentions that the worst work is done. Of course festivals and hype are the stock and trade of Richard Wagner whose music inspired Ring Festival LA. Wagner's own festival, Bayreuth, has repeatedly presented the exact same ten operas for well over a century. Such a festival exudes the feeling of a religious ceremony. "John Marcher" (an anonymous San Francisco blogger and opera fan) recently mentioned that he was looking forward to his first visit to Bayreuth. He called it his "Bayreuth baptism". 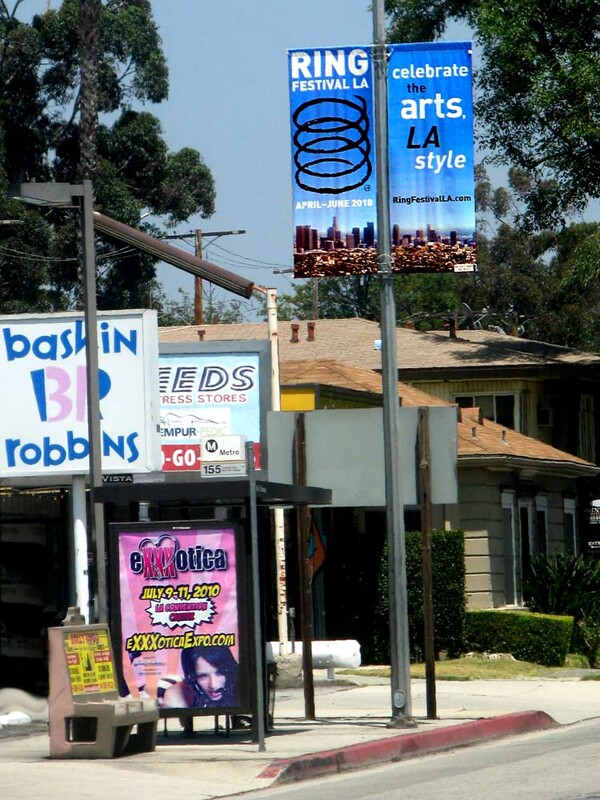 Of course festivals and hype are the stock and trade of Los Angeles which always has a lot of arts festivals. Here's a list. There are even more film festivals in LA including many ethnic ones: African-American, British, Iranian, Chinese, Chicano, Italian, Croatian, Danish, Filipino, etc. etc. On the radar screen of all local fesivals, Ring Festival LA was barely a blip. And of all the festivals which Los Angeles has ever seen come and go, only one ever reached the level of "a defining moment in the cultural history of Los Angeles". That was the wildly successful 1984 Olympic Arts Festival. It had a huge budget, adjusted for inflation, worth $24 million today. After barely a decade, the positive effects disappeared, swallowed by an era of recession and riots. The Olympic Festival, and the equally successful 1987 Los Angeles Festival, were led by Robert J. Fitzpatrick, then President of CalArts. With money to spend and the support of city leaders, the festivals included the widest possible variety of dance, opera, jazz, music, theater, art, and film - from all over the world and from right here in Los Angeles. Conversation skips to Festival 1989, which he hopes will focus on Latino and Asian culture. He suggests picking as his successor "someone who has the ability to stage a festival, to get a fresher perspective." Declaring flatly that there would be "no European works at all" at the 1990 Los Angeles Festival, Peter Sellars said Tuesday that he hoped the three-week September event would prove to traditional arts patrons that the kind of work "previously considered the margin was, in fact, the center." "I would like the festival to do for this city things that none of the (existing) institutions in this city can do," he said. "Collective power is what I hope the L.A. Festival will be about." All this is my way of introducing a fascinating review of the 1990 Los Angeles Festival. Since these festivals were all pre-Internet, there is not much information about any of them online. This particular piece, entitled HIDDEN IN PLAIN SIGHT: Los Angeles Festival 1990, was posted by the author Don Shewey to his own website. Here are some quotes - but if you're really interested in this pinnacle of a local arts festival I suggest you read the entire article. "I was all ready to bring a bolt of my Mozart opera productions and whatnot," Sellars has said. 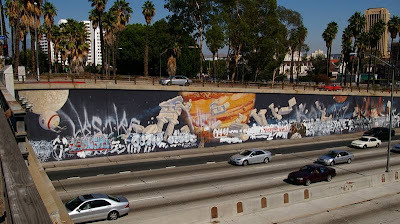 Then he took a good look at Los Angeles, noticed that the population was dominated by Asian and Latin American people whose cultural traditions had nothing to do with Mozart or Europe, and changed his mind. 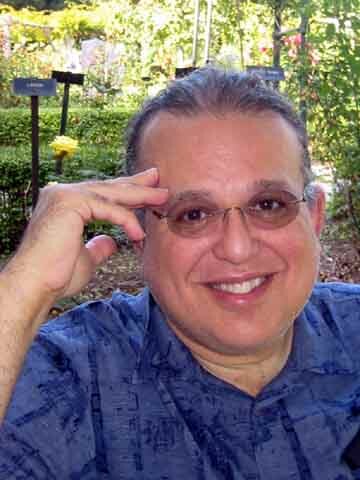 Shewey discusses the spiritual aspect of many of the performances he witnessed. Remember that this was the controversial era of Jesse Helms, Robert Maplethorpe and Andre Serrano's Piss Christ. That's right, it was a religious festival, a celebration of spirituality. Of course, selling the Los Angeles Festival that way would probably have caused no less of an uproar than if it had been billed as a celebration of babykilling. That's why you never heard the words "religious" and "spirituality" officially attached to the festival -- in the cultural climate we live in, those words are taboo, especially within the arts community, which feels itself to be under attack by the religious Right. And yes, the Los Angeles Festival was a political festival as well -- another no-no and another attribute that somehow Peter Sellars found it convenient (and probably wise) not to trumpet too loudly in the press. In fact, you could say that the festival took place at the intersection of religion and politics. I was going to say that the Asians supplied the religion for the most part and the Latin Americans the politics, but I realize those are cultural cliches -- the spiritual Orient and the fiery Latin rebel. The fact is that the intersection of religion and politics takes place at the center of virtually all Pacific cultures (Korean, Mexican, Polynesian Chilean, Filipino, etc.). That's exactly what makes those cultures profoundly alien to American mainstream culture, which is so eager to avoid religion and politics that it will climb mountains of junk and swim through oceans of trivia to get away from them. The Los Angeles Festival was ingeniously designed as a corrective to this American attitude. Ingenious because it sold itself neither as exotica (an array of dazzling freak shows) nor as medication (a bitter potion to choke down because it's good for you). In fact, it sold itself pretty much the same way its two predecessors did, as a celebration of world culture, without the slightest hint of apology for the omission of international superstars along the lines of Peter Brook, the Royal Shakespeare Company, Pina Bausch or Ariane Mnouchkine. One of the international superstars of the 1984 festival which Shewey doesn't list was the Royal Opera of Covent Garden which brought works by Mozart, Puccini and Britten to LA. Placido Domingo sang the lead in Turandot. Those performances inspired the elite of Los Angeles to form their own opera company. Apparently they were embarrassed to admit to their equally over-rich friends from other cities that Los Angeles had no opera company to call its own. Such, I suppose, are the tribulations of too much money. Placido Domingo was artistic advisor and board member for LA Opera from the very beginning. Later he became General Director. He has guided the company in one way or another for over 25 years. And today, of course, Los Angeles does have an opera company that our elite can boast about to their friends. It has proved its technical, musical and artistic prowess by producing a complete Ring cycle. But it is also now burdened by a huge deficit and a huge debt, the result of a perfect storm of over-reaching, bad management decisions and a collapsing economy. It certainly failed to define anything about the cultural history of Los Angeles, except possibly that it's out of touch. It even failed to satisfy traditional Wagner fans. It made barely a dent on the consciousness of Angelenos via marketing and community outreach. With the Ring in its rear view mirror Los Angeles Opera could decide to now set itself the goal of really creating a defining moment in Los Angeles culture. The first thing it would need to do is thank Placido for his services and send him packing. His contract has only one more year to run. 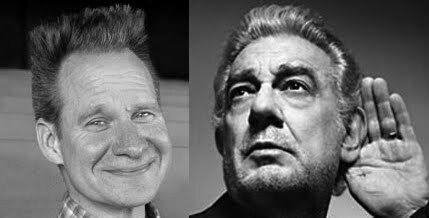 At least Placido has not left LA Opera in as bad a situation as his other opera company in Washington D.C.
Any new leader must be intimately familiar both with the traditional European art form called opera and also with the incredibly multi-cultural place called Los Angeles. Only half in jest, I'd like to suggest that Peter Sellars be considered for the post. He's uniquely qualified, never dull, always thought provoking and lives right here already. He even won something called the Erasmus Prize for contributions to European culture. Peter probably can't raise money the way Domingo's star power can nor is his track record as an administrator particularly stellar. But others can count beans and stand as figureheads. Sellars is an idea man. I guarantee any ideas Sellars comes up with will be better for LA than trying to create Bayreuth on the Pacific. LA Opera needs a good idea or two to explain why the rest of the community should care about it. The company needs to preserve those aspects of opera that keep the current fans buying tickets while convincing even a sliver of the rest of the population to give it a chance. The good news is that opera shares many things with popular storytelling - movies, television, novels and opera are all filled with love, romance, intrigue and death. People like that. The bad news is explaining why opera seems so foreign, so formal, so habitual, so burdened by tradition, so old fashioned. Opera is never going to shed its European heritage completely, nor should it. But if it really wants to be some sort of defining force in Los Angeles, a metropolitan area of 15 million people from all over the world, the European model needs to change. That a local organization like LA Opera can spend so much time, resources and energy recreating old world models is the real reason why all of us, not just the wealthy elite, should feel embarassed about opera in Los Angeles. Recreating what goes on in Europe is what makes Los Angeles a profoundly provincial place. Of course the opera's board of directors may be quite happy living in the provinces. Los Angeles is a big city and our own opera company is now officially world-class. Now someone needs to ask "what is an opera company for?" I think it's time to start imaging how to make better use of it. You won't be too surprised to learn that I've got some other ideas about how to do that. If I can get my energy and indignation levels back up, it's pretty certain that I'll share those ideas here. Los Angeles is an intensely multi-ethnic place. Last January LA's mayor - speaking at the opening of LA Arts Month - said that 46% of Angelenos are foreign born and 67% are people of color. He also said they speak 224 languages and represent 37 national groups which are the largest outside their home countries. We come from every part of the world. And we come with our culture. We come with our music. We come with our traditions, our food, and we bring all of those here to this great city. And I think that's where the spirit of LA arts scene lies. It's where the soul of the city (is). It's what makes us different - with all respect to the ex-New Yorkers here. You can watch him ramble here. Surprisingly, Los Angeles County already has an opera company with a much better idea of how to exist in modern California society than LA Opera. It's in Long Beach. Here's a short history of LA Opera. $30,000,000 should buy you more than a Wagner comic book larger than life. Hell, $30,000,000 ought to buy you three first-class new Ring productions. There are a lot of parallels between Jimmy Swaggart and (Richard) Wagner -- both were cult figures who cloaked themselves in public religiosity and promoted themselves shamelessly. Of course he said that back when people would have understood what an incredible hypocrite Jimmy Swaggart actually was. I suppose you can't be a hypocrite without lots of hype. Here's a 1990 article from a Seattle newspaper about the Olympic and Los Angeles festivals. Read about the current state of the freeway murals here. Placido's picture came from here.